Several of the largest U.S. airlines have started paying dividends within the past few years. Which airlines will be the next to initiate dividends? Five years ago, there was no reason for dividend investors to look at the airline industry in the search for income. Hardly any airlines paid dividends then. Those that did, such as Southwest Airlines, often had token payouts with yields far below 1%. JetBlue hasn't joined the airline dividend crowd -- yet. Image source: JetBlue Airways. However, as airline profitability has rebounded in recent years, more and more airlines have initiated dividends. Today, four of the six largest U.S. airlines pay quarterly dividends. Some have yields in line with the market average. For example, Delta Air Lines stock currently has a yield of about 2%. Two more airlines could potentially start paying dividends within the next year: Hawaiian Holdings (NASDAQ:HA) and JetBlue Airways (NASDAQ:JBLU). Let's take a look at why they could be the next airlines to target income investors. Hawaiian Holdings, the parent of Hawaii's only major airline, has reported enormous profit growth since 2014 as investments made a few years earlier have started to pay off. 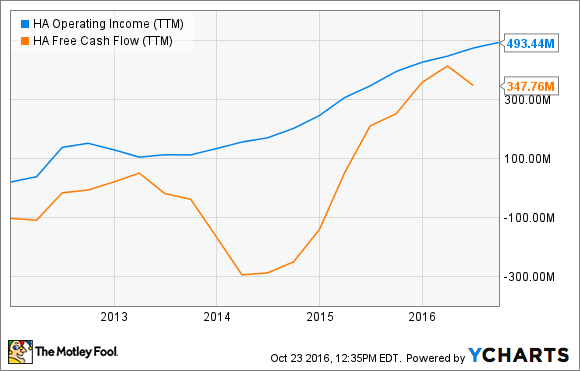 Free cash flow has also surged in the past two years. Hawaiian Holdings Operating Income and Free Cash Flow data by YCharts. Thus far, Hawaiian has spent the vast majority of its free cash flow on debt reduction. At the end of last quarter, the company had $565 million of outstanding debt and capital lease obligations, down by nearly $500 million from two years earlier. The company has also spent more than $50 million on share buybacks since April 2015. Hawaiian Holdings' stock price has doubled since the company began its share repurchase program a year and a half ago. As a result, management hasn't been very aggressive about buying back stock. This has left Hawaiian with a lot of excess cash. Free cash flow is set to decline in the next few years, due to higher cash tax payments and higher capital spending. Nevertheless, Hawaiian could easily afford to pay out $25 million to $50 million in dividends annually, enough to offer a 1% to 2% yield. A steady dividend would allow Hawaiian Holdings to return cash to shareholders without worrying about whether its stock is overpriced. JetBlue Airways could also consider joining the dividend crowd at some point in the next year. While the company has engaged in occasional share buybacks, the goal has usually been to offset employee stock awards rather than to return cash to shareholders. 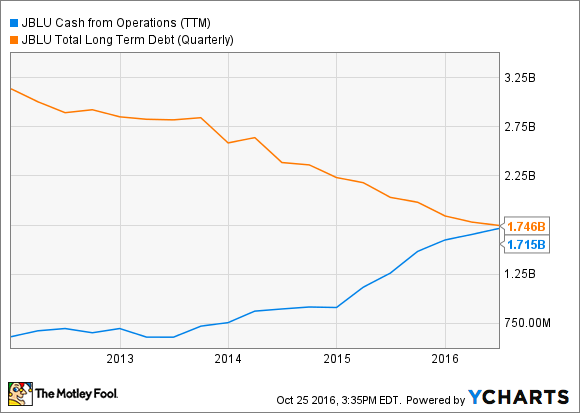 Instead, the bulk of JetBlue's free cash flow has been devoted to debt reduction in recent years. The company had just $1.7 billion of debt and capital leases on its balance sheet by the end of last quarter, down from $3.1 billion at the end of 2011. By the year's end, JetBlue will have less than $1.4 billion of outstanding debt and capital leases. Meanwhile, its operating cash flow has nearly tripled. JetBlue Operating Cash Flow vs. Debt data by YCharts. This will allow JetBlue to turn to a more balanced allocation of capital between investments in the business, debt reduction, and shareholder returns. Notwithstanding its relatively aggressive growth plans, JetBlue should be able to generate at least $500 million in free cash flow on average for the next several years. Even if some portion of that total is used for further share buybacks and debt reduction, JetBlue could certainly afford to set aside at least $100 million a year for dividends, enough to offer a yield above 1.5%. Of course, it's possible that JetBlue will continue to prefer buybacks over dividends. (Many growth companies do.) The company is likely to shed more light on its capital return plans at its upcoming investor day in December. It can be hard to predict when a company will start paying a dividend. For example, some companies hoard cash to protect against a rainy day; others prefer the greater flexibility of share buybacks. Nevertheless, I expect dividends to become increasingly common in the airline industry. It makes sense for airlines to signal that they are committed to producing steady profits rather than blindly chasing market share. Paying a dividend is a great way to do so. Based on their strong free cash flow and improved balance sheets, Hawaiian Holdings and JetBlue Airways both look like prime candidates to initiate dividends soon.